Behaviour is affected by numerous factors ranging from small things such as what the weather is like or whether we have eaten breakfast to genetics and the social norms of the culture we live in through to life changing events such as the addition of a sibling or loss of a loved one. Listed below are just some of the external and internal factors that may impact of the behaviour of children in sessions. As forest school practitioners we may have some control over some of the internal and external factors such as level of expectation and hunger. Some factors though, such as home life situation or physical disability, we are unlikely to have any control over but may be able to focus sessions that support the child or young person in developing the skills needed to be resilient to or overcome those challenges. Maslow stated that people are motivated to achieve certain needs. When one need is fulfilled a person seeks to fulfil the next one, and so on. 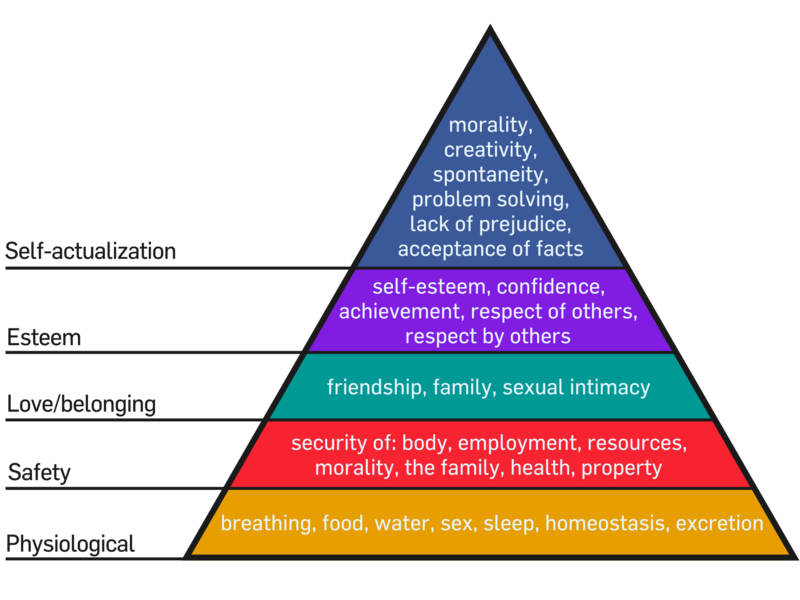 His five stage hierarchy of needs model is divided into basic needs – physiological, safety and love/belonging, and esteem and growth needs – self-actualization. When a child displays challenging behaviour during a session it is worth considering each of these needs, working from bottom to top, to see if it is possible to identify and need that the child may be missing. Sometimes, as it often is with my own children, something as simple as food or drink can have a profound impact on their behaviour and emotional state.